Things About Who, What, When, Where and Why: It is what it Is! and continues to bloom and bloom. And it makes her happy that it is doing so good for her. no need to be looking for greener pastures. And this brings me to my grateful list. I am grateful for being, and for right now, that is enough. I am grateful that you are my friend...who is wise beyond her years and so special to me!! Love the hibiscus! I think that is what it is...anyway...beautiful. I am so glad it began blooming again. What a wonderful treat! Sometimes plants just don't get over the disruption of being transplanted. Kind of like us. "It is what it is" is one of my bosses favourite sayings. so I hear these words often. So true though often we try to make things better when they are already perfect. I am glad you get to still see you plant flowering and doing well. I am grateful too. Grateful for many many things in my life. Blessing to you this week my friend! I am grateful our paths crossed. You're so wonderfully inspiring, Cinner! Monica, your just a sweetheart, hope your hand is feeling okay....is it both that give you trouble.Hugs. Cora, same to you Cora...I think I need to get doing a list every day...I think I have the fathers day blues. Liss, It is like me wondering what I will be when I grow up. That snuck up on me, so I just stay in the moment as much as I can. Glad your doing well, wondering how your new pet is doing. Brian, that is the thing, who knows maybe we are blooming already. lol. 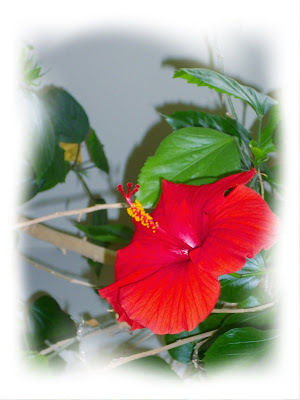 SueAnn, yes it is a hibiscus...it was my pride and joy as far as plants go. I am really glad it blooms for her. I am glad your in my life too. hugs my friend. ED, your such a love, thank you. take care. TechnoBabe, boy that is the truth...sometimes I should be back in another pot....lol. kidding. This is beautiful, Cindy....my favorite color is red. I am grateful that your life is blessed, too.